SNS provides the ability to create Topic which is a logical access point and communication channel. Each topic has a unique name that identifies the SNS endpoint for publishers to post messages and subscribers to register for notifications. Subscribers receive all messages published to the topics to which they subscribe, and all subscribers to a topic receive the same messages. Subscribers (i.e., web servers, email addresses, SQS queues, AWS Lambda functions) consume or receive the message or notification over one of the supported protocols (i.e., SQS, HTTP/S, email, SMS, Lambda) when they are subscribed to the topic. Provides commands for a broad set of AWS products, and is supported on Windows, Mac, and Linux. HTTP, HTTPS – Subscribers specify a URL as part of the subscription registration; notifications will be delivered through an HTTP POST to the specified URL. Email, Email-JSON – Messages are sent to registered addresses as email. Email-JSON sends notifications as a JSON object, while Email sends text-based email. SNS allows applications to send time-critical messages to multiple subscribers through a “push” mechanism, eliminating the need to periodically check or “poll” for updates. SQS can be used by distributed applications to exchange messages through a polling model, and can be used to decouple sending and receiving components, without requiring each component to be concurrently available. SNS and Lambda are integrated so Lambda functions can be invoked with SNS notifications. The topic is created, and it has the name you specified for it. You can create a topic on Amazon SQS, not on Amazon SNS. This question doesn’t make sense. A user has deployed an application on his private cloud. The user is using his own monitoring tool. He wants to configure that whenever there is an error, the monitoring tool should notify him via SMS. Which of the below mentioned AWS services will help in this scenario? A user wants to make so that whenever the CPU utilization of the AWS EC2 instance is above 90%, the redlight of his bedroom turns on. Which of the below mentioned AWS services is helpful for this purpose? A user is running a webserver on EC2. The user wants to receive the SMS when the EC2 instance utilization is above the threshold limit. Which AWS services should the user configure in this case? A user is planning to host a mobile game on EC2 which sends notifications to active users on either high score or the addition of new features. The user should get this notification when he is online on his mobile device. Which of the below mentioned AWS services can help achieve this functionality? A company is running a batch analysis every hour on their main transactional DB running on an RDS MySQL instance to populate their central Data Warehouse running on Redshift. During the execution of the batch their transactional applications are very slow. When the batch completes they need to update the top management dashboard with the new data. The dashboard is produced by another system running on-premises that is currently started when a manually-sent email notifies that an update is required The on-premises system cannot be modified because is managed by another team. How would you optimize this scenario to solve performance issues and automate the process as much as possible? Create an RDS Read Replica for the batch analysis and SQS to send a message to the on-premises system to update the dashboard. Which of the following are valid SNS delivery transports? Choose 2 answers. 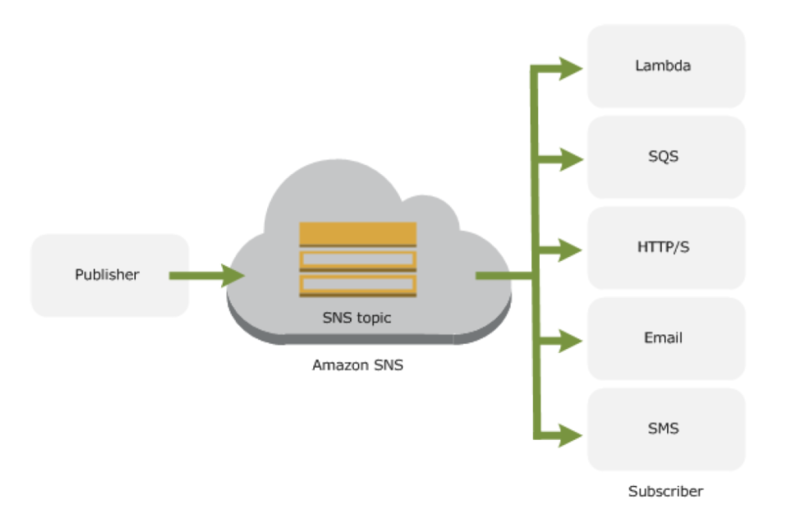 What is the format of structured notification messages sent by Amazon SNS? Which of the following are valid arguments for an SNS Publish request? Choose 3 answers. Thanks for this post. I am trying to trigger a lambda function using SNS notification. I was just wondering that payload is encrypted by default or do we have to encrypt explicitely. Hi Kabeer, the payload is not encrypted by default. For question 9: I think Option “a” is correct. Its main performance issues using the main database, it would be easier to use Read replica keeping the same interface and reducing the load from the main database. My question here is “How can Read Replica do the analysis?”. RDS Replica is bascially to offload the Batch analysis jobs to reduce the load on the actual master database. Can you help me with the following question as to why is the answer for this is D? The explanation for which seems to be a “user’s private cloud”(data center). Is this how the flow would be? An instance in the data center failed. You send cloudwatch matrics to AWS using CLI or API. With couldwatch matric, you trigger the SNS notification, which in turn uses SQS to trigger an instance in the data center? If the instance fails, CloudWatch alarms can send a notification to SNS which in turn can send then trigger something to notify on the user’s private cloud like an SMS, or through and HTTP endpoint by which the action can be performed.